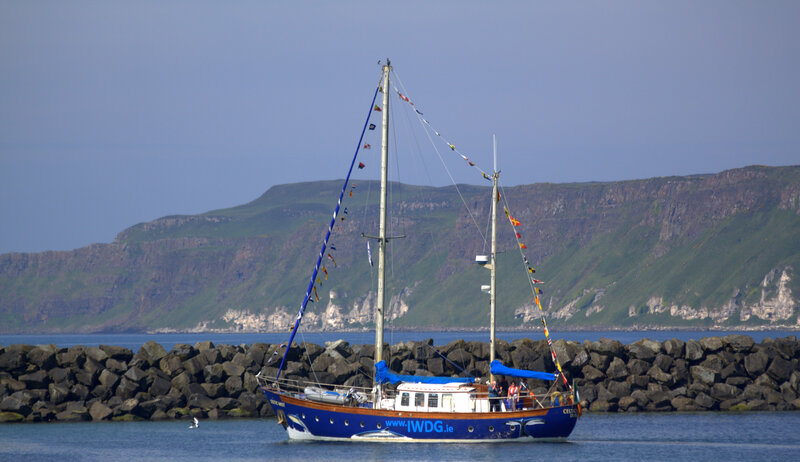 Celtic Mist sailed to the North East Coast mid May to attend the Ballycastle and Rathlin Sound Maritime Festivals. The Irish Whale and Dolphin Group team onboard were given a warm welcome by the friendly islanders and an excellent weekend was had. Our Northern Ireland Officer Suzanne Beck and IWDG volunteers promoted our work throughout the weekend and brought all our new members sailing around Rathlin Island onboard Celtic Mist, where they were accompanied by Harbour Porpoise and Bottlenose Dolphins. by IWDG Member Margo KiernanFrom the moment we began to gather on board the Celtic Mist in Ballycastle it was clear that this trip had the making of great memories. We were greeted by our galant skipper Garry who’s calm became obvious as the week progressed. Patience of a saint had Garry (aka job)! Next we met Marvellous Mick our on board Marine scientist who had the ability to pass on his amazing store of knowledge (in any chosen accent) to all, including the slow learners, which title I hold for myself for being knot dyslectic! Congratulations to Mick for having received confirmation of his final qualification while on board. If Mick wasn’t taking water samples/keeping records/answering questions or keeping the crew entertained he could be found, ‘resting his eyes’ in the cosiest bunk on board, the location of which we are sworn to secrecy. Not to down grade the porpoises, of which we saw numerous from day one, the display put on by Minke Mum and baby was the highlight of the trip. For nearly an hour they entertained us rolling gently and majestly around Celtic Mist. Great photos got by Alan Sean and Mick. The motly crew had set a target of 100 sightings for the week but were well satisfied with 89, including porpoises, harbour seals, grey seals, minkes and a sea otter.